It’s official, we are snowed in at the moment. I suppose if it were an emergency, we could get out and around, but the officials are asking everyone to stay off the roads, as we have picked up around 12-13″ of snow in the past 12 hours and winds are blowing at 30-35 mph, with gusts to 45. The snows are suppose to keep up at a pretty decent clip right on through the evening and winds are suppose to get stronger, with sustained winds of 35-40, gusting to 55 to 60 mph. 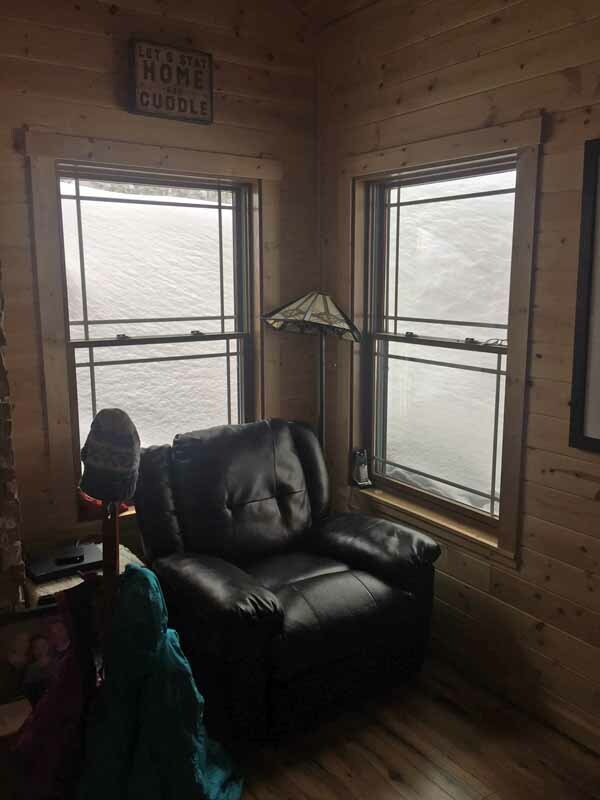 I’d love to show you a picture of how things are out there, but with officials asking that we stay in and the fact that the snow is piled up past the windows, the best I can do is this. That is the “snow chair”. Now more appropriately named than ever! Not all of the windows are that snowed in, the ones in the dining room have a bit of a hint of light. The kitchen windows sit underneath the overhang of the cabin roof, so the view is nearly unobstructed there. The bump off in the distance is part of the swing set, which is now completely buried under the snow. Needless to say we will be staying white for some time. 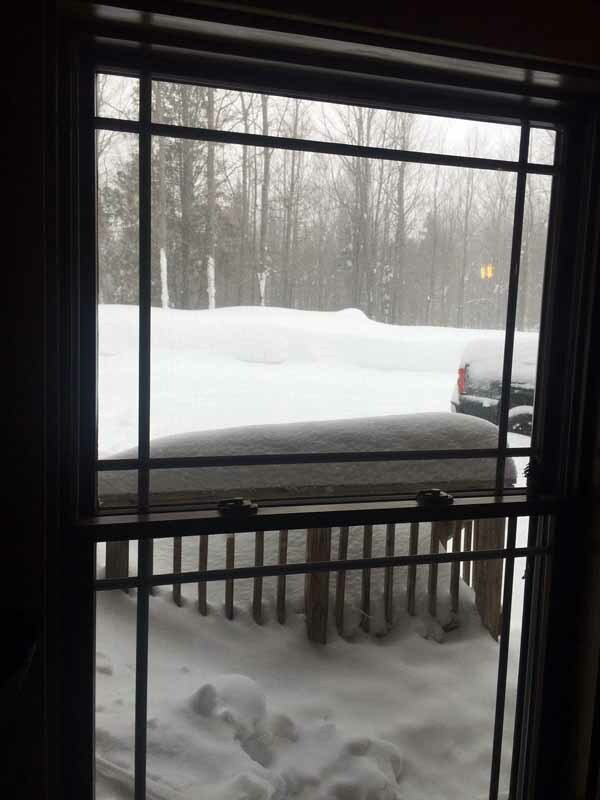 Not only in the 50″+ of snow on the level as deep as I have seen it in some time, but the fact that the snow is also very dense will cause it to stick around for a while. There is a growing concern for flooding once the melt arrives in earnest in a month or so. I measured just shy of 6″ of moisture in our snowpack on Monday, but we have picked up around 30″ of new snow since then. So it is probably up around 7-8″ of moisture. For as much snow as we have and have gotten, we still have some nice, quiet periods. We even saw the sun pop its face out of the clouds on a couple of occasions this past week. 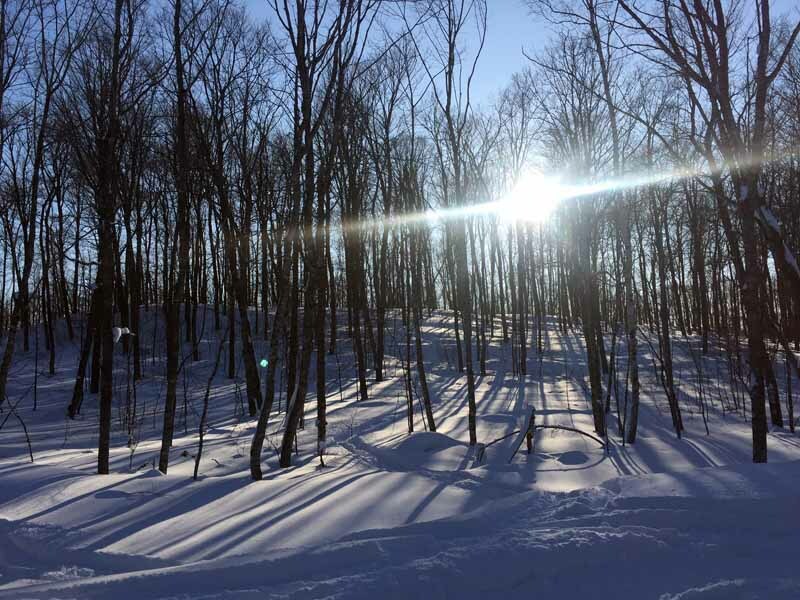 The suns energy and the time it spends above the horizon are both becoming much more noticeable and on the days when it is not snowing at the rate of 1-2″ per hour with 45 mph winds, it actually feels like spring is drawing near. Just not today! 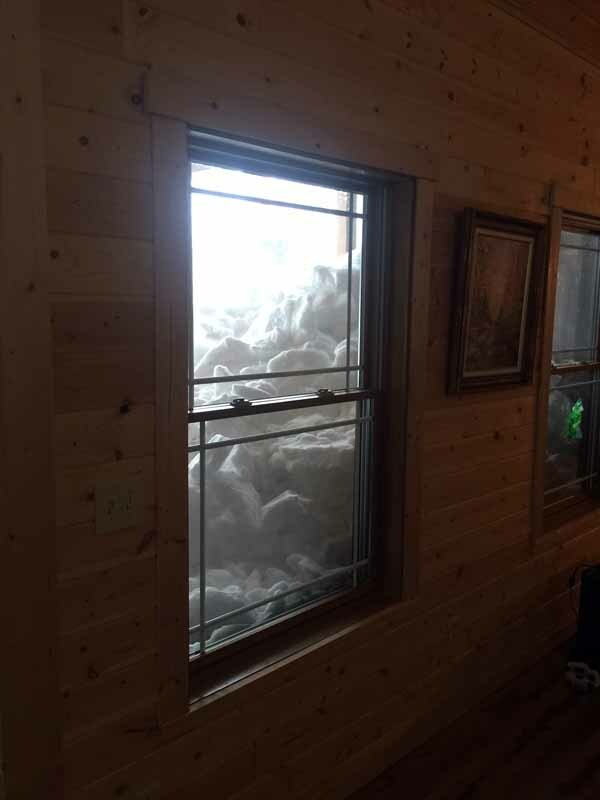 The mounds of snow are growing everywhere. 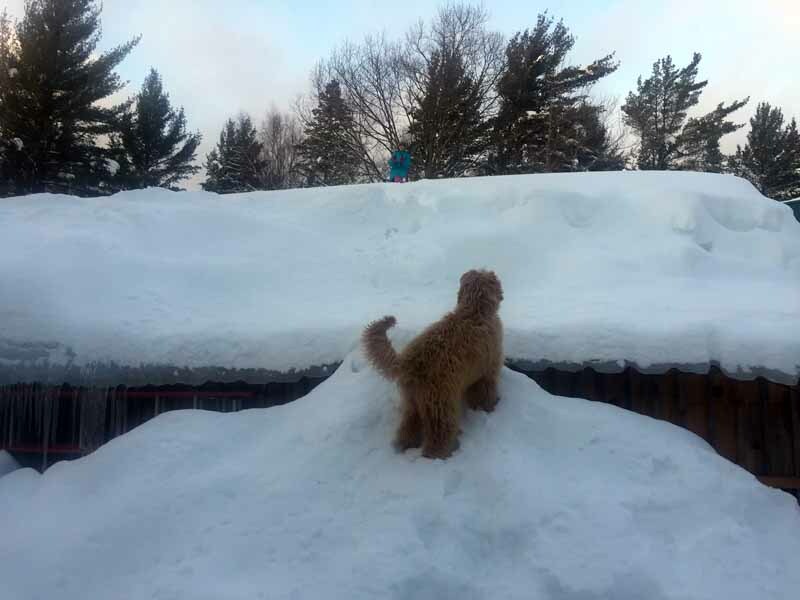 The snow I shoveled off the roof of the lean-to allowed Gracie to do some exploring of the shop roof the other day. After looking on for a brief moment, Bleau decided it looked like fun and joined her. Grace and I are slowly working on a sled run that will take her from the top of the shop roof, to the eave, then onto the snow pile and then to the ground. Ending in a yet to be realized spot in the woods! Probably not a lot of kids that can say they have had that kind of a sled run. 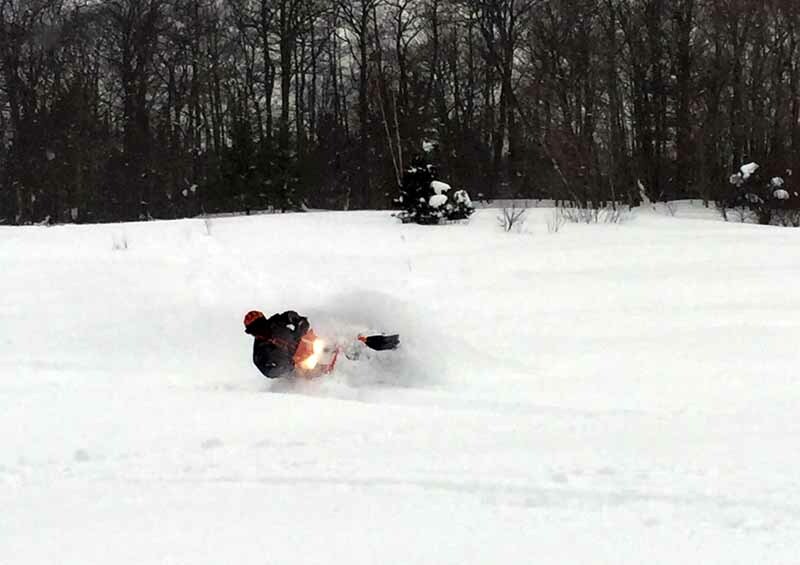 I tripled the amount of snowmobiling I have done for the season this past weekend. Friends arrived up here Friday morning and we headed out for the rest of the day and rode. Conditions were very nice. 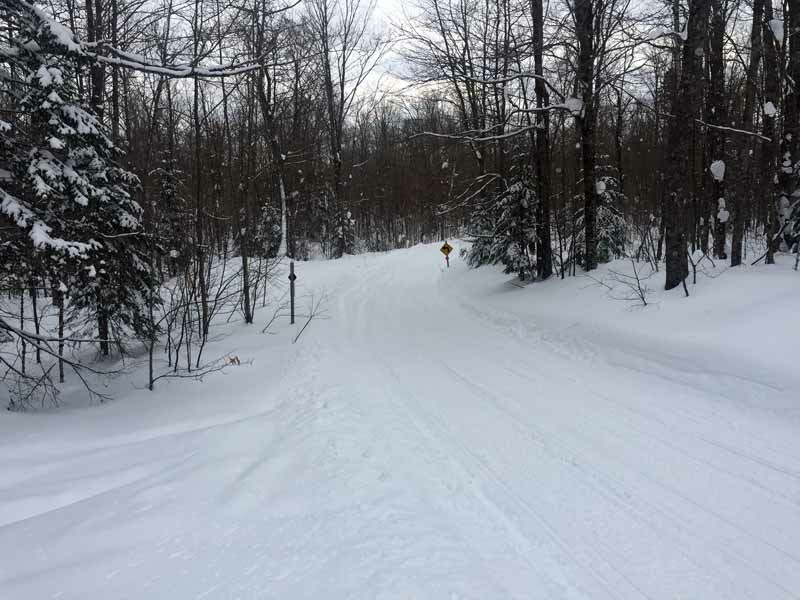 The 10-11″ of fresh snow Wednesday night and Thursday morning had settled some, but still did a good job of covering up most of the tracks from the previous weekend and allowed us to steer the sleds with body weight and not the skis. It’s deep out there. I did not take any measurements while out riding, but easily 5-6 feet plus in spots. 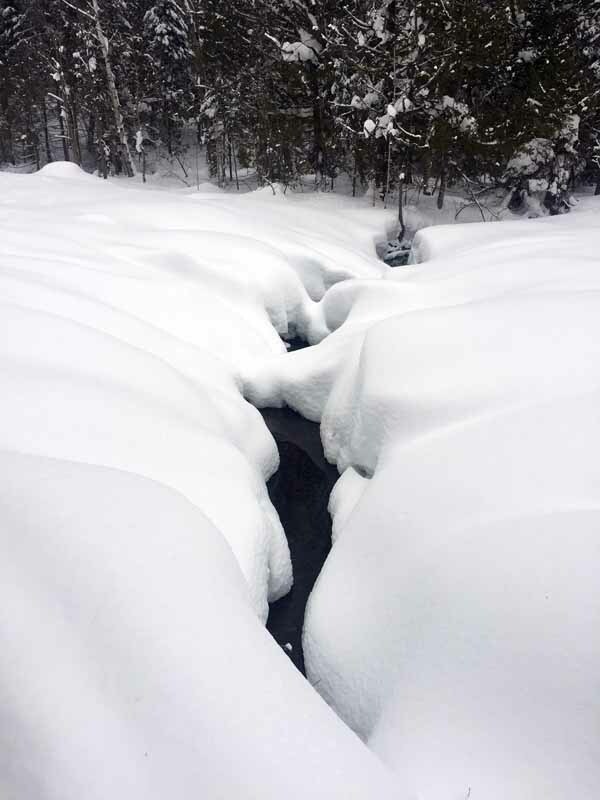 About the only way to tell the actual depth of the snow is to be at a place where there is still bare ground showing, or in this case, a creek still flowing. It’s kind of hard to tell how deep the snow is there, but if I could have convinced one of my riding companions to go stand in the creek, the snow would have been over their heads. As the afternoon wore on, the clouds departed and left us in blue skies for the remainder of the ride. If it is not snowing, then I would prefer it to be sunny out. All the little nuances in the terrain show up and thus I am not surprised by a bump or dip in the snow that I could not see with the flat light. The other nice thing is I can use the sun for navigation. In the case of Friday evening, all we had to do was keep heading towards the sun and we would find home! Saturday morning was a bit of a relaxing one, with a nice breakfast and then we all got suited up to ride. 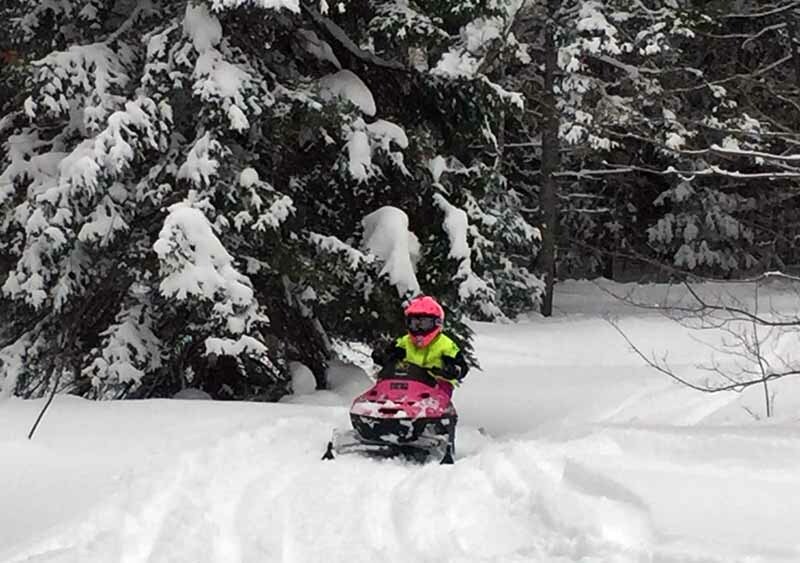 Gracie was really wanting us to take a little ride with her before we left, so I got her sled out of the shop for the first time this season and tried to start it. After many attempts by several of us, we were able to get it started, but it did not run very well at all. So one of our guests is a mechanic and offered to pull the carburetor off and clean it up. That being done, Grace was off to ride. Things were going pretty good, until she had to climb up of the driveway and into the deep snow of the woods. We had made a path for her, but that little 120 just did not have the gusto to take her all the way. Next year there is an excellent chance that she will be on a new sled. 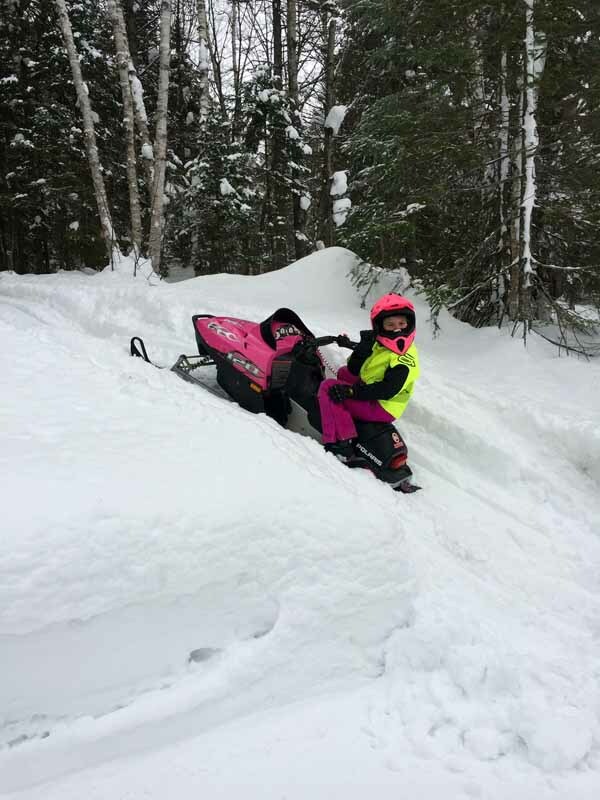 As much as I would like to get her onto a full sized adult sled, I think the 200’s from Arctic Cat and Yamaha will be the best size for her. For the rest of this season I think the 120 will be enough. After giving Grace some time in the saddle, we all headed out for the rest of the day for a ride of our own. We went a slightly different direction from the day before, but still found great riding. The trails we were on were nice and flat and the fields full of powder. I was a little sore after Friday’s ride an a lot more after Saturday’s ride, but really had a good time riding. The conditions were nearly optimal and the riding partners fun. It re-assured me that even though I have not been riding as much in the past few years as I used to, it is still a very fun activity for me and not one I have any intention of walking away from. In fact, if Grace keeps her bug for riding, then I can see us heading out pretty regularly in the future.